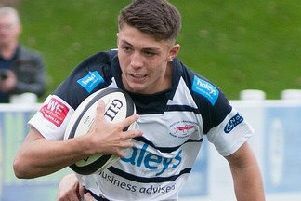 Five tries in 20 minutes either side of half-time set Preston Grasshoppers on their way to comfortably avenging a heavy defeat at Hinckley earlier in the National League Two North campaign. In all, they racked up seven tries – including a hat-trick for winger Tyler Spence, which understandably won him the man-of-the-match award. But there were many other fine performances once Hoppers had run off some rather lethargic efforts in the opening quarter. Head coach Paul Arnold said the team had “a bit of a rollicking at half-time to bring them back down to earth”, as some of them were getting a little too exuberant following three quick scores. Once again able to all give his match-day squad a full workout, Arnold said: “There were a lot of steady performances and the lads who were brought in have stepped up and done well.” Among thbefore were experienced prop Dan Madden, who celebrated his first start of the season after injury by bagging a rare try, and Will Davidson, brother of fly-half Tom, who his coach said “looked sharp” on his debut off the bench. Tom Davidson got his side moving as early as the third minute when he landed a penalty for a high tackle. But after a first quarter of near-stalemate as Hoppers started sluggishly, Hinckley took a shock lead, a cross-kick into acres of space leading to a try for full-back Joe Wilson, who also converted. That stung the hosts into action and No 8 Matt Lamprey got their first try – and his 12th of the season – rounding off a move that he started with a bulldozing run to getting over from close range after several desperate tackles on the Hinckley line. Davidson converted, but couldn’t add the extras to the next two tries, both scored by Spence. For the first, he picked up a loose ball deep in his own half and outpaced all the cover in a 60-metre dash. The second was initiated by another charge from Lamprey and kept alive by brisk passing among the threequarters, including a deft overhead flick by Sam Stott to set his winger free. Between these scores, Wilson missed a penalty and Hinckley squandered a try by losing the ball on the line. Spurred on by Arnold’s half-time pep talk, Hoppers scored twice in the opening seven minutes of the second period. Centre Alex Hurst secured the bonus point with an interception try from halfway, then good work by Adam Howard, James Gough and Stott put Matt Crow over. Davidson converted both. More chances went begging, with Scott Jordan unlucky with two kick-aheads – one just going dead, the other seeing him tackled almost on the line – while poor ball control cost a couple of others. With Hurst in the sinbin for illegally halting a rare threat to Hoppers’ line, the visitors capitalised with an unconverted try by centre Tom Wheatcroft. But Spence settled any nerves with his 14th try of the campaign, courtesy of a half-break and pass by replacement forward Ollie Tripper. Davidson converted, Hinckley replied with a try by centre Ryan Hough from a cross-kick, but Hoppers had the last word with Madden’s try, as he was driven over from close range. Wilson and Davidson added a conversion each as the hosts celebrated a sixth successive win to maintain their place in the top half of the table.